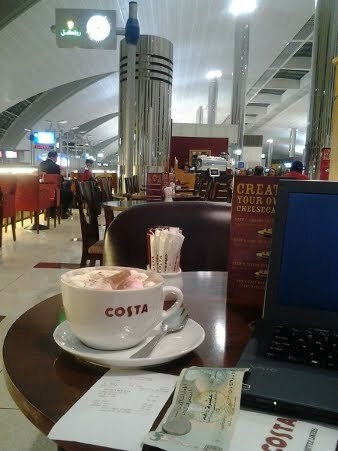 As far as airports go, there is only one word to describe DXB, AKA Dubai International Airport: Big. Actually, scratch that. There are two words to describe it: big and busy. This was my first experience in an airport outside the US, so I can't say I had any expectations upon arrival. My initial mindset when getting off the plane was to immediately find my connecting gate. . . But then I remembered that I would have quite a bit of time to kill. Local time in Dubai was 7:20 PM when we landed, and my connecting flight to Bangalore wasn't scheduled to leave until 3:30 AM. Eight full hours with change to kill: more than enough time fully restore the blood flow through my veins, to wander around the 18.6 million square feet of floor space and become as acquainted as I could with the International Airport Scene. One of my first challenges was refueling. While the airplanes in the 90 degree heat outside were sucking down on what was probably the cheapest gas in the world, I was actually cold in the blasted air-conditioning, thanking the heavens that I'd brought a light jacket. Cold and tired, I decided to seek out some warmth and refueling of my own. Perfect weather for hot chocolate. I spotted a Starbucks, but berated myself for even considering it. No, I told myself. I will not be one of those silly Americans standing in line at Starbucks in a foreign country! I cemented this decision and made a secret vow to myself to not dine or drink in or patronize any American franchise the remainder of my trip. The next promising place I happened across was called Costa. It But the prices were all in Dirhams (imagine that!). So this is where I ended up paying $7 USD for a cup of hot chocolate with giant pink marshmallows. It wasn't the best hot chocolate, nor was it the worst. But it did give me enough short-term energy to locate my connecting terminal (it was only approximately 10 miles away), and to find a seat and catch a few winks of sleep. By the time 2:40 AM rolled around, I was so over sleeping in airports. I'd actually conked out pretty hard for a brief period of time, with my face smooshed up against the arm rest of my seat, and my face had a lovely red impression the shape and texture of the arm rest carved into it. But they were announcing boarding, so I didn't have time to be vain. When I finally stepped onto that Airbus A340, I was thrilled to discover that I had a window seat! The plane took off, and as we climbed up and up in elevation, a sense of overwhelming excitement took over. In about 4 hours, I'd be on solid ground for over two weeks (longer than I'd stayed on solid ground during the past month!) in the country that I was pretty sure was my home in a previous life. My ears popped, and the landmarks of Dubai became smaller and smaller below me. The moon was huge, and I took it as a good sign. Part of me wanted to hold my tablet up to the window and snap a picture of the view of the giant yellow moon above the city of Dubai like a kid might. But then the adult part of myself took over, and convinced me that if I were to do that, I'd become a source of amusement and laughter of my fellow passengers. I was already in the minority: being a non-Indian, fair-skinned, and female. Not to mention lacking a head dress or Bindi. Not to mention travelling alone. So I never did get the picture of the Perigee Moon of May 4, 2012. But I have the snapshot of memory, and its placeholder in the timeline of my adventure.